With three league champions in the Keith Millar B Cup semi-finals you expected some fireworks and drama on Sunday, and the two matches certainly didn’t disappoint. 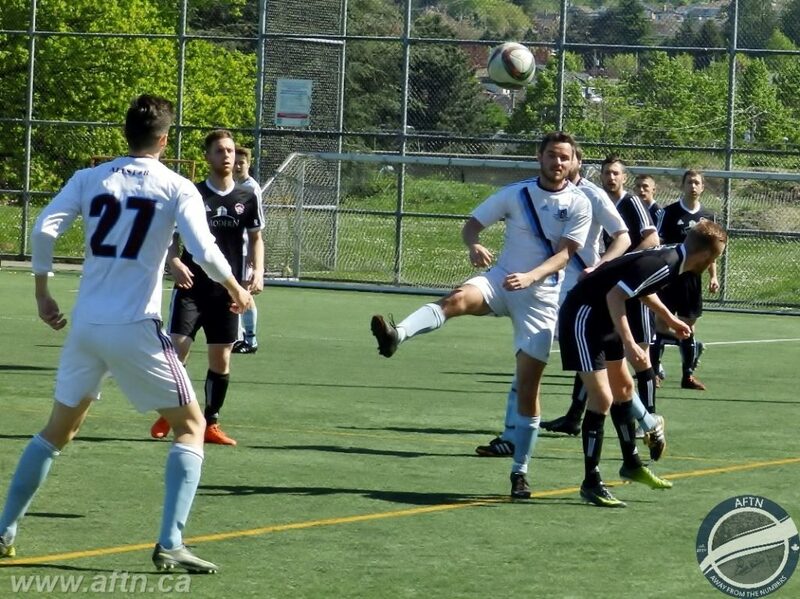 The end result is a tantalising final comprising of two Vancouver Metro Soccer League (VMSL) sides – Division 2A champions Coquitlam Metro Ford Lupi and the only team to beat them this season, Vancouver Strikers. 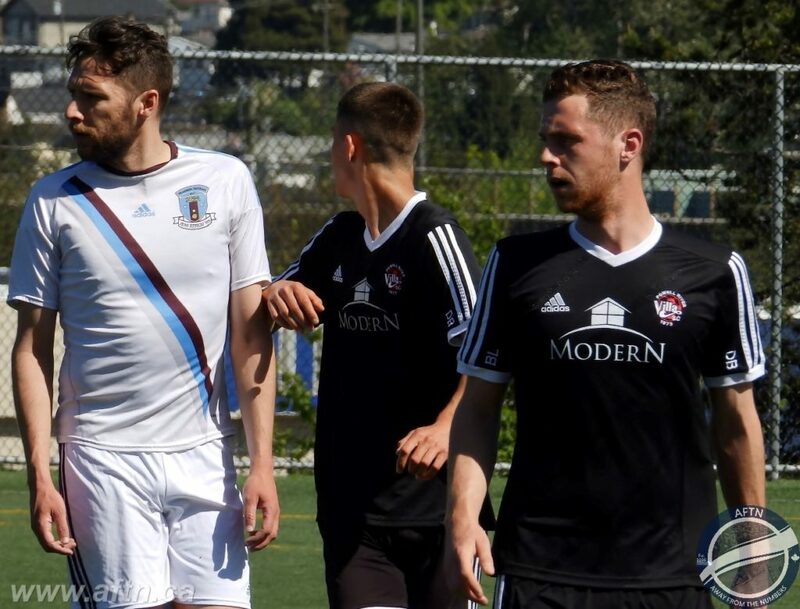 It certainly sets up an interesting storyline, but both teams were made to work right down to the wire to claim their spot in Saturday’s final at Burnaby Lake. The first of the weekend’s semi-finals took place on the Van Tech turf in Vancouver on Sunday afternoon. The 3.30pm kick off saw the match played in sweltering conditions, but that didn’t stop a loud army of scarf bedecked fans making the long journey down from the Sunshine Coast to see Vancouver Island Soccer League Division 3A champions, Powell River Villa, try to knock off VMSL side Vancouver Strikers. It also didn’t stop both teams going hell to leather from the first whistle in a very fast-paced and lively first half. 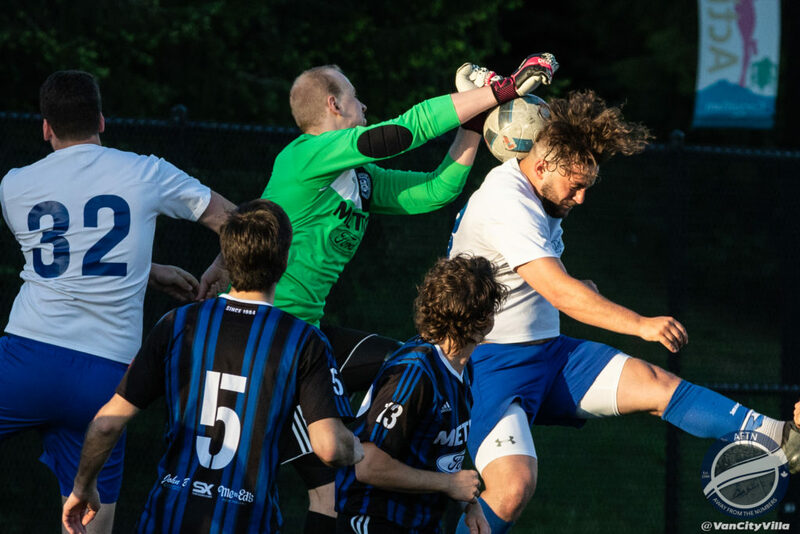 Having already knocked out the Fraser Valley and Richmond league champions, Strikers were out for the hat-trick, but their job wasn’t helped by losing their first choice goalkeeper to a Slo-Pitch injury earlier in the week. The action was quick from the off, with Powell River having the better of the early play and coming close with a couple of chances, much to the delight of their vociferous travelling faithful. But those fans were silenced momentarily in the 20th minute when Gavin Lytton got on the end of a long kick out from the Strikers goalkeeper to finish superbly with a dipping effort over Villa keeper Matt Liknes. Their lead was only to last 14 minutes before the VISL visitors tied it up from the spot after the lively Jake Kenmuir was brought down in the box. It was quite a soft call, but Powell River didn’t care about that and Kye Taylor stepped up to drill the ball home and make it one apiece. Both teams pushed for the go-ahead goal before the break, with Strikers seeing an effort headed off the line, but neither team could find the breakthrough and the sides went in level at the half. It was no real surprise to see the action dip considerably in the second half, as the heat and what was at stake combined to turn the match into a much more cagey affair. Powell River were certainly looking the more dangerous side and what goal threats there were, were coming from Villa, with a couple of close calls. But the Strikers did force a good point blank save from Liknes to show that they were still a danger themselves. As the match ticked into stoppage time, an extra 30 minutes felt inevitable, but a momentary lapse of concentration from a throw in was to prove very costly for Villa. 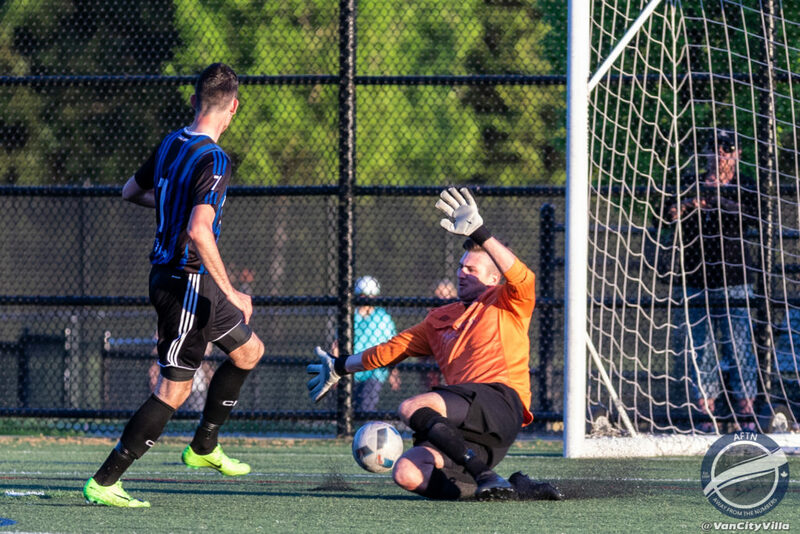 The Vancouver side played a dangerous ball into the box across goal which the Powell River defender didn’t attack, allowing Will McKnight to nip in and fire home a dramatic late winner to send the Strikers to their first Provincial final. A tough way for Powell River’s fantastic season to end, but what a win for the Vancouver lads. Their impressive Kingslayer run continues, as they now try to knock one final team off their throne. You can see some highlights from the match (with two and a half of the goals!) in our video below. And you can also see a few photos from the match, taken inbetween shooting some video, on our Flickr account HERE and in the slideshow below. 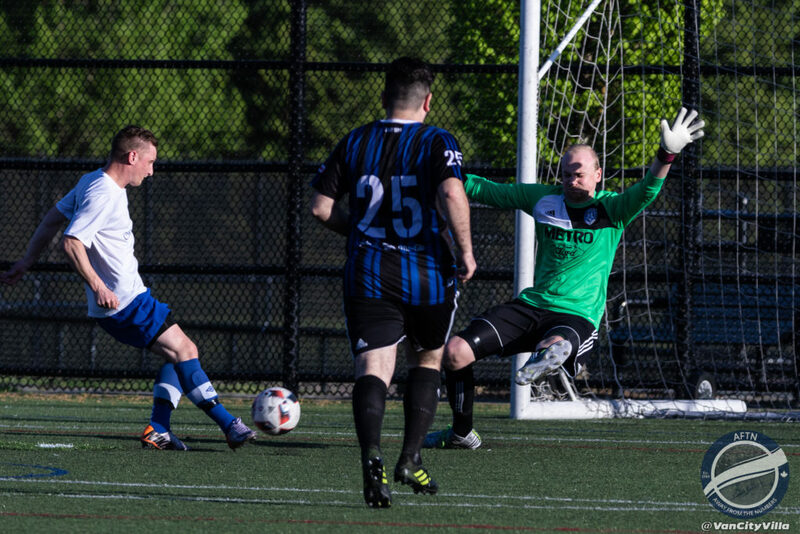 The second semi-final kicked off in Coquitlam just over an hour after the Strikers had claimed their spot in the final and it was a battle of league champions as VMSL double winners Coquitlam Metro Ford Lupi hosted Burnaby treble winners Impero Calcio. You fancied this one to be a match that would go right down to the final whistle and you weren’t left disappointed. It was another fast paced start to a semi-final with both sides taking the action from end to end. Metro Ford were having the more dangerous chances, with Eric Dove proving to be a right handful up front for Lupi. So it was no surprise when it was Dove who fired the home side into the lead nine minutes in, running onto a long ball and outsprinting the Impero defence to tuck away the opener. Metro Ford’s pace was definitely causing problems, and they were having a lot of success in setting up chances with the long ball over the top that left the Impero defence chasing shadows. 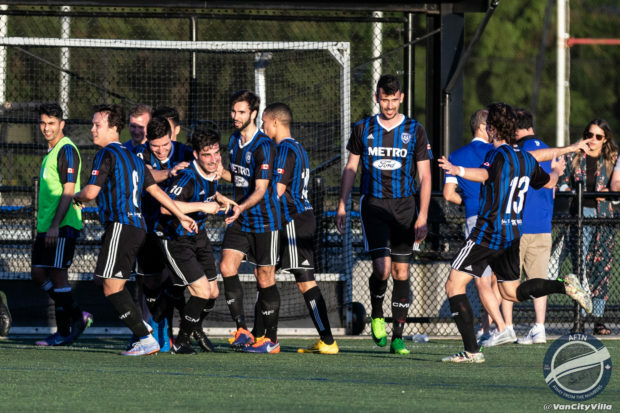 But when you have a player like Lucas Sweda in your ranks, Impero were always a danger proposition to get on the scoresheet themselves and it took only five minutes for them to reply, with Sweda sweeping home a low ball into the box after a nice move by the Burnaby champs. That goal seemed to settle both sides down a little and frenetic start subsided, with both teams having half chances but unable to find a way through either defence to get the go ahead goal before half time. It still felt like anyone’s game for the taking, with the next goal crucial. Coquitlam were the ones to get it just past the hour mark when Michael Mobilio finished off a nice solo move with a cut inside and strike into the bottom right hand corner of the Impero net. Ten minutes later and Dalibar Plausic made it three when he ran in unmarked onto a long diagonal ball, showed nice control, and fired home to make it 3-1, surely putting an end to Impero’s quadruple dreams. Sweda was played in with five minutes to go, outpacing the chasing Lupi defender to give Impero some home and set up an exciting finish. I’d have quite happily taken another 30 minutes of the action from a match that would have been a worthy final, but Metro Ford finally killed off their Burnaby visitors in stoppage time when Dove scored the goal of the game, with a lovely looping finish off a Mobilio cross. A 4-2 final and Lupi’s second season of existence will now be capped off with a Provincial Cup final appearance. You can see all of the goals, and some other highlights, from the match in our video below. Duncan Nicol (@VanCityVilla) was also shooting the match for us and you can see his excellent photos on our Flickr account HERE and in the slideshow below. Those results now set up a final on Saturday between a team going for the treble up against the only team to hand them a defeat all season. An interesting side story for two clubs going for their first ever Provincial title. Kick off is a Burnaby Lake at 5.30pm and we’ll bring you a full preview of that match, and the other men’s finals, tomorrow.